A sensational wingman who magnificently served three clubs over an 18-season career, Steane Kremerskothen can lay claim to being one of the most durable footballers Tasmania has produced. Born in 1964, Kremerskothen’s senior career began with Launceston at the age of 17 in 1982. He played 49 games in three seasons with the Blues, including losing Grand Finals in 1982 and 1984 before moving south to join TANFL side Clarence in 1985. It didn’t take long for Kremerskothen to cement himself as a regular member of the Clarence senior team, playing in the club’s losing 1985 Grand Final side against Glenorchy in his first season. At the end of 1987 Kremerskothen found himself at his third club in five seasons when recruited back north by North Launceston, and it was here that his career really took off. Kremerskothen instantly became a mainstay of the strong Robins teams of the late 80’s and early 90’s, compensating for a lack of pace with an innate goal sense and sublime disposal to great effect. These skills also meant he was a regular Tasmanian representative during the period, playing seven matches for the state, including matches against the Northern Territory at the Bicentennial Carnival in 1988 and Victoria at North Hobart Oval the following year. Unfortunately, despite all of Kremerskothen’s individual excellence, North Launceston sides of the era were horrendous underachievers, claiming minor premierships in 1989, 1991 and 1992 and making Grand Finals in 1990, 1991 and 1993 without ever claiming a premiership. A member of all of these sides, Kremerskothen now boasted the unenviable record of no wins from six Grand Finals, and must have wondered whether he would ever experience premiership glory. After claiming North Launceston’s Best and Fairest award in 1994, Kremerskothen was named captain of the club (for the second time) for the 1995 season. It would be a dream appointment as that would be year that Kremerskothen’s premiership dream was finally realised. Under playing-coach and former Carlton champion David Rhys-Jones the Robins claimed a drought-breaking premiership with a thrilling 10-point victory over Clarence to finally give their captain that elusive flag, along with the added thrill of hoisting the cup. Kremerskothen continued on racking up games and accolades in the twilight of his career. 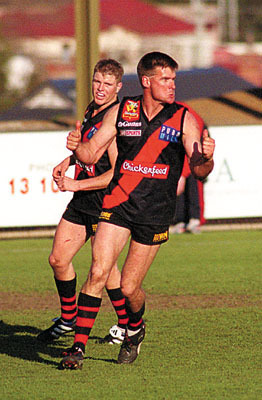 A second Best and Fairest award at the age of 33 in 1997 was followed in 1998 by a second premiership as the (rebranded) Bombers under former Fitzroy and North Melbourne star Mathew Armstrong went through the entire campaign undefeated. 1999 would be Kremerskothen’s final season, and in the Second Semi Final against Glenorchy he became the first man to play 350 senior games at the highest level (NTFA/TANFL/NWFU/TFL Statewide). His 352nd and last came in the Grand Final against the same opponent two weeks later, but sadly Kremerskothen was unable to go out on a premiership, as the Magpies dominated all day to win by 46 points. Between Round 1, 1985 and the 1999 Grand Final Kremerskothen missed only nine games, playing 303 of a possible 312 – a truly remarkable display of durability. Post-retirement, Kremerskothen spent a year as an assistant coach with North Launceston in 2000, before joining the Tasmanian Devils in the VFL as an assistant to Mathew Armstrong. After leaving that role at the end of 2004, he spent a few years away from the game before returning to North Launceston as an assistant from 2009-11. A beloved and faithful servant of North Launceston, Kremerskothen has been showered with honours by the club, including Life Membership, a testimonial dinner and inclusion in its Greatest Team from 1945-1999.